Keep Kids Alive Drive 25® is a campaign based in Omaha Nebraska. whose mission is to end all deaths and injuries caused by speeding on all roadways. KKAD's target is zero deaths, zero injuries. To do less is to accept and tolerate deaths and injuries to loved ones; daughters, sons, mothers, fathers, brothers, sisters, aunts, uncles, grandparents, and friends. But what caught my eye was a tireless effort to spark grass roots campaigns in towns and cities all over the country. They have kits for community organizing but, for those who don't have the energy or the time KKAD offers these great trash can decals that are available for purchase. 40% of your purchase goes toward KKAD so it's a great opportunity to walk the walk while donating to this great cause. Imagine if everyone on the block had these stickers on their trash and recycling cans. And what if communities delivered recycling cans with the stickers already pasted? Talk about message reinforcement. In a similar effort Chicago's Active Transportation Alliance in partnership with the Alliance For Biking and Walking has retained the advertising firm BBDO to create a Drive 22/Slow Down campaign. Speed Limit signs that end in 5 or 0 are routinely observed and therefore ignored by many. Look for that campaign to start up early next year in select cities and hopefully expanding beyond after that. Both campaigns should offer great synergy with bicycle/pedestrian advocacy and especially Safe Routes to School. I'm not sure how effective Slow Down campaigns are at getting people to slow down. Having a sign on a trash can that is visible several hours a week is unlikely to have much of an effect on people's behavior. A 22 mph speed limit sign may change behavior due to the novelty of the sign but as the signs become commonplace I suspect they will no longer be effective. 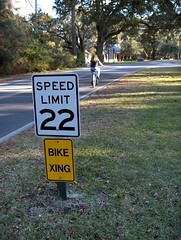 If people are ignoring a 25 mph speed limit why won't they ignore a 22 mph speed limit? Thanks for highlighting our Keep Kids Alive Drive 25 campaign. 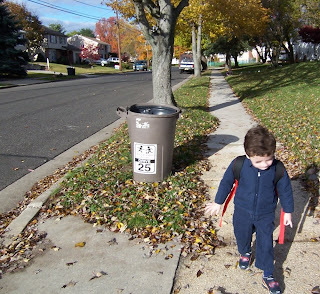 Resources to begin your neighborhood effort can be found at http://www.keepkidsalivedrive25.org/campaign/.